Oh, it let me put up the file, but when I downloaded the file, it was insanely small and wouldn't decompress. Handles uploads, downloads, and everything we should need. Did you see my post on HowToUpload? It says how to get files into the server so you can link to 'em for the Wiki. It works for me, anyway. I just uploaded a file "WarpSpeed.tar.gz". then the other code that links to it, right? I actually just used the upload.php thing before I saw this post . One thing is that I do like the schema of the Event Horizon Wikipage, but I think it needs that default nav-bar thing to make it as navigable as the standard wiki-sites. If you could put that thing back in and colorize it to the black and orange Solaris look, that would be cool. "Never sneak up on a turtle while he's welding"
Thanks for reading the documentation, that is much appreciated. I had totally forgotten to fix that page after I'd realized that the wiki upload stuff didn't work, and have corrected the help files since realizing that. Sorry I hadn't fixed it sooner. Just a quick work in progress pic of a new ship, to prove I'm still alive I just finished my exams and start a vacation position in about two weeks, so I'll try and put out a couple before then. 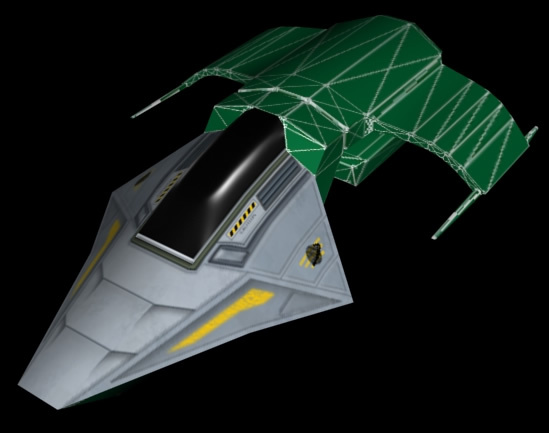 I'm thinking of this one as the stock-standard little fighter of the Terran Empire. Using 512x512 maps now.